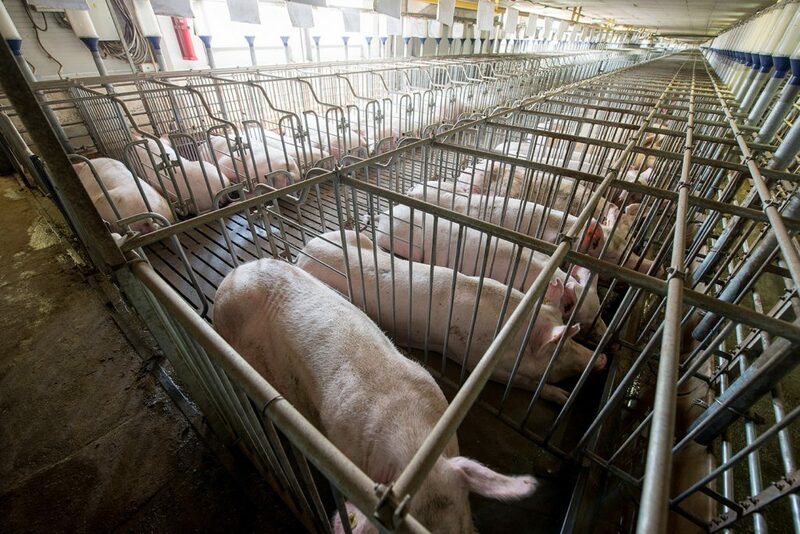 Though North Carolina is considered a hot bed of hog farming activity, there are other states in the US suffering due to the close proximity of confined animal feeding operations (CAFOs) to nearby communities. In Northeastern Iowa, nearly 25,000 hogs are kept in factory farms just five miles from North Winneshiek School, where Birgitta Meade teaches fifth and sixth grade. Twenty-three years ago, the first factory farm was constructed in the region, and since then, they’ve sprouted up like weeds. The result has been a mixture of noxious fumes and regulatory negligence. Residents in Meade’s area have plans to file a lawsuit against the Iowa Department of Natural Resources (DNR), the state regulatory agency which has been all but silent on the matter. In Iowa, farmers store hog waste in underground pits, where the feces and other decaying material fester in a space without oxygen. Needless to say, the waste produces fumes. To ensure that the fumes stay away from the hogs, farmers use giant fans to vacate the aerated compounds. Meade is worried that the children at North Winneshiek are more vulnerable than their adult counterparts. Young ones breathe faster and have smaller lungs, so it stands to reason that the ammonia and hydrogen sulfide would wear away at their respiratory systems. Not long before Iowa residents decided to pursue legal action, 500 residents in Eastern North Carolina won a major victory in a lawsuit against Murphy Brown, a subsidiary of Smithfield Foods, which is the largest hog farming company in the world. This is big news in a state where residents suffer due to the poorly maintained lagoons. In just five counties in North Carolina, these lagoons contain nearly 15.5 million tons of feces, according to a 2008 General Accounting Office report. Rene Miller, who lives in Eastern North Carolina, explained the noxious environment in her town. During her walks to the nearby cemetery, where her deceased family resides, she inhales the deadly fumes, which cause her nose to run and her eyes to leak moisture. It’s worse on hot summer days, when the humidity causes the sprayed waste to sit motionless in the air. It’s like walking through a thick blanket of putrefying death. In the lawsuit, North Carolinian residents complain that the odor has literally deterred them from exiting their homes; that boxes full of hog carcasses yield unbearable smells; that the hogs themselves bring buzzards and gnats to town; that the aerated fumes drift into homes and school buildings; and in short, that their area has been made into an unlivable hellscape. Local residents, most of whom are poor and African American, won this most recent hog farm lawsuit, and now there are 23 more to go. It should be stated that their victory was lessened by a federal judge who lowered the damages to $3.25 million because of a state cap on punitive damages. This was a major blow to 10 residents who would have won over $5 million each. Now they will each receive $325,000. In Iowa, residents demand that the state regulator does what it is supposed to do: regulate the storage and disposal of hog manure, which according to the state is “animal excreta or other commonly associated wastes of animals, including, but not limited to, bedding, litter, or feed losses.” Plaintiffs claim that the air-blown waste counts as a type of manure and therefore should be regulated by the state agency.